A Paris-based start-up is growing strawberries all year-round in repurposed shipping containers in the heart of the city thanks to hundreds of multi-colored LED lights. The founders of Agricool say they have found the perfect levels of light, humidity, and nutrients needed to grow strawberries in four sealed containers in the streets of the capital. 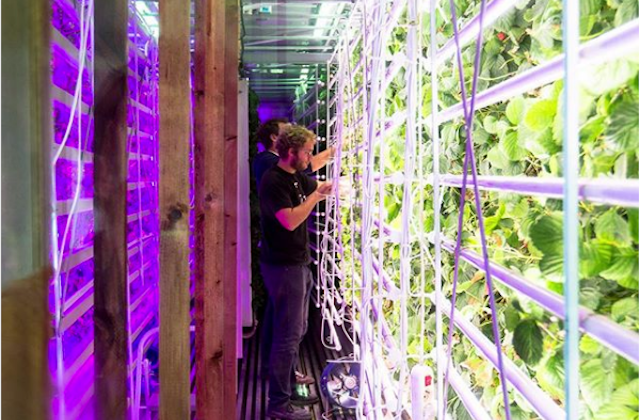 The strawberries are grown vertically to save space and the lights are turned on and off to mimic day and night time. Agricool, which has been selling strawberries in Paris since February, says that by growing them near to where they’re sold, the strawberries have time to ripen and are better for consumers than ones picked prematurely and transported hundreds of miles via fridges and warehouses. Fourdinier says his strawberries, which are sold for double the price of traditionally-grown strawberries at 5 euros for 250 grams, contain 10 times as much vitamin C.
The start-up, which currently has four containers around Paris, is part of a growing trend of urban agriculture in the capital.